Almost one year on, our favourite Hawkins residents are still coming to terms with what happened in their town. Sadly, Will Byers (Noah Schnapp) is not doing too well and his mother, Joyce (Winona Ryder), is scared to leave his side. Meanwhile, Mike (Finn Wolfhard) is still grieving the loss of Eleven (Millie Bobby Brown) and Nancy (Natalia Dyer) is struggling to cope with what happened to her friend Barb - leaning on both friend, Jonathan Byers (Charlie Heaton), and her boyfriend Steve (Joe Keery) for support. Dustin (Gaten Matarazzo) and Lucas (Caleb McLaughlin) are trying to move forward with their lives, playing video games at the local arcade and speculating about a new girl called Max (Sadie Sink) and her scary older brother, Billy (Dacre Montgomery). However, can anyone in Hawkins really move on - particularly as the nightmare may be far from over? It is hard to imagine the pressure that Matt and Ross Duffer felt when trying to write the sequel to their phenomenally successful Netflix series, Stranger Things. 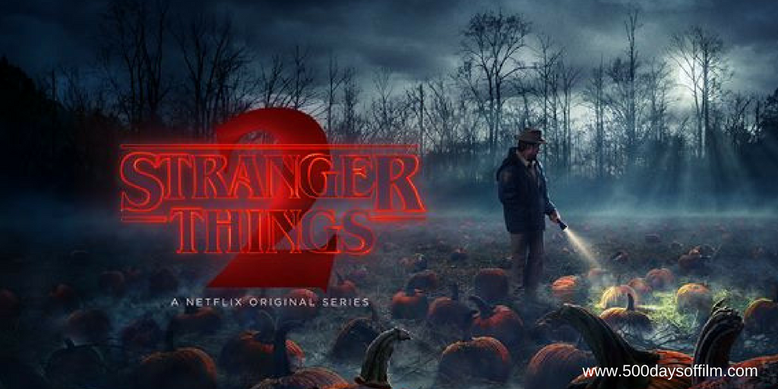 Thankfully, while it takes a couple of episodes to get going, Stranger Things 2 is gripping, binge-worthy brilliance. The brothers have revealed that they started work on season two before the show became a hit. However, fan reactions must have come into play at some stage because (alongside another delicious helping of 80s nostalgia) Stranger Things 2 gives us many of the developments we wanted but dared hope for. Want more Dustin and Lucas? Got it. Want more Steve? Check. Want another awesome soundtrack? No problem. Want Barb’s life to matter? Come right in. In addition, Stranger Things 2 also subverts our expectations. Some of the season's new characters actually manage to surprise, while our beloved original characters develop and form alliances in ways we may not expect. The cast continues to impress - all giving powerful performances. Once again, Finn Wolfhard and Millie Bobby Brown get the most obviously emotional scenes (according to Wolfhard, his character was nicknamed emo Mike in this series). Meanwhile, David Harbour's Jim Hopper also gets many powerful (and moving) moments and it is great to see more of Noah Schnapp - his portrayal of Will (who was missing, of course, throughout most of season one) is superb. The most obvious difference between season one and season two is that Stranger Things 2 is far more cinematic. Many scenes are visually stunning and, ironically, demand to be watched on as big a screen as possible. The Duffer brothers had a far bigger visual effects budget to work with and this investment is put to great use. Alien / Aliens - the inclusion of Paul Reiser, Eleven’s hair and the horrific developments throughout the season. ET - as in the first series, there are many references to ET in Stranger Things 2 - from the ET toy we see on a shelf, to the way Dustin tries to lure a creature outside. Ghostbusters - in episode two, the party dress up as characters from Ghostbusters - cue a great discussion about Winston Zeddmore. Blade Runner - the Strange Things score always brings Blade Runner to mind. Back To The Future - some familiar skateboarding action going on. Gremlins - there are many Gremlins references throughout Stranger Things 2. However, to go any further would be to risk spoilers. The Thing - again, I don't want to veer into spoiler territory, but The Thing is an obvious influence. Top Gun - this may be just me but I was reminded of Top Gun during a couple of ‘sports’ scenes with Steve and Billy. The Terminator / T2: Judgement Day - we see clips and hear references to both of these two films in Stranger Things 2. Close Encounters Of The Third Kind - a lot of visual cues reference this Spielberg classic. Indiana Jones - never leave your hat behind! Stand By Me - again, Stand By Me references permeate this season. The Goonies - the inclusion of Sean Astin was bound to ramp up The Goonies vibe. See if you can spot the other fun Goonies references! The Exorcist - towards the end of Stranger Things 2, there is a brilliant nod to to The Exorcist. Firestarter - bring on the telekinesis! Poltergeist - TV static anyone? Pretty In Pink - again, maybe this is just me, but the final episode had me remembering the final scenes in Pretty In Pink. With all of these references, Stranger Things 2 could easily fall into the hands of those who criticise the show for being overly derivative (a criticism addressed in one of this season's episodes). However, for me, Stranger Things 2 is far more than a series of knowing reference points. Both seasons of Stranger Things are anchored by a powerful, original story - there’s impressive inter-dimensional world building going on here - told by a cast of characters that we truly love. The final two episodes of Stranger Things 2 work so well and inspire such emotion because we care so much. I laughed, I gasped and I cried - I found myself as invested in their coming of age experiences as I was in the Upside Down. l certainly can’t wait to return to this strange world. Roll on season three!